For this installment in his Long and Whining Road series, Club member Allen Schwartz reminisces about his upbringing in the Bronx and his aptitude for things mechanical. We have a large club, so most members don’t know me at all. Even those I’ve gotten to know since joining the club two years ago don’t really know much about me. What they do know is that I am not a “car guy,” that I am not “handy.” While I love cars and have always loved cars, I unfortunately am intimidated by mechanical things. I’d love to be able to change my own oil, put on new brake pads — heck, rebuild an engine. I want to have to buy that stuff that degreases your hands. But instead I get jittery just hooking up my trickle charger. I’m afraid I’m going to do something wrong, fry the battery, blow up the garage, electrocute myself. Why is this? You see, I grew up in the Bronx. My father was a young Bronx attorney who served as a cook during WWII. The military, as many of you know, has a knack for putting the right person in the right job. After the war, he ended up living in a Quonset hut in the South Bronx with my mother and older brother, who was just a baby. Soon they moved into a public housing project in the north Bronx, in the Pelham Parkway section. When I was born in ‘48, I joined them in a two-bedroom, one-bathroom apartment on the third floor of this red brick post war structure. The building itself boasted an elevator, and every floor had a garbage chute that allowed you to dump your refuse directly down to the basement, where it would be incinerated and shot out as chimney smoke the very next day! Watching that smoke billow from the many chimneys in the project and slowly disappear into the blue sky, I remember asking my father what would happen when the sky was full of smoke? (We’re starting to find out.) Our neighbors, all lovely people, were mostly hard working blue collar families. Many of them saved up their money and bought homes in new suburban developments springing up in Westchester and Long Island, places like Levittown. But not my father and mother. They had many sisters and brothers who lived in the Pelham area; hence my brother and I had many aunts, uncles, and cousins. We were Jewish, and like most Italian, Irish, Greek, and Puerto Rican families in those days (and second generation immigrant families today), these clans tended to stick together. It was, therefore, my fate to spend most weekends socially trapped within this extended family, kneeling on the floor with my cousins, building and attacking tin metal forts, killing plastic Indians with plastic rifles, spinning wheels on board games, and flipping tidily-winks into tea cups. Not until my father was in his forties did we move, and then only to a nicer apartment building ten blocks away. Although a local lawyer who did real estate closings galore for his contractor clients, he never owned a home in his life, a child of the depression who always fretted, I think, about not making the mortgage payment. Besides, for him, living in an apartment was swell! If something went wrong, you just called the “super” (nowadays known as the maintenance man, or even the “building engineer”), and the super would fix it! For free! Therefore my father never had any interest in, nor developed any skills related to, making or fixing things, and as a consequence neither did I. Sorry to say I have no stories of sitting beside my dad as he took apart a carburetor or brake assembly, or even a toaster oven, and repaired it, with me handing him tools and him dispensing mechanical wisdom to a spellbound son. No, my father’s entire toolbox fit within a single kitchen drawer, comprised only of a screwdriver, hammer, and pliers. Those three implements could do anything he ever needed to do, mechanically speaking. We parked our car on the street outside the apartment complex. When we washed the car, we’d fill up a bucket with soap and tap water in the kitchen sink, then lug it down in the elevator, walk a few blocks to the curb, and scrub the car with sponges. Then we’d dump the dirty water into a sewer, go back up and return with a clean bucket for the rinse. We’d do this a few times. I never owned a hose until I bought my first home at the age of 31. Even so, I loved cars. As a young boy, I admired the variety of designs and details, and like most of my friends, we memorized each year’s makes and models (all domestic at the time) and could name any car from a block away just by its tail lights or grill. The Fifties, when I grew up, was in many ways the heyday of American motorcar design, or at least it’s awakening. That was the era when running boards were dispensed with, when big tail fins and Christmas tree tail lights were first introduced, the time when the front wheels of the car were finally brought under the hood where they belonged and no longer stuck under a bulbous external fender like a gangster car in a Forties film noire. The first car I can remember my father buying was in 1955, when I was seven. One night he triumphantly proclaimed to the family that we were going to buy a brand new Chrysler New Yorker. I was very excited when I saw the brochures. To compete with the more stylish Chevrolets and Fords of the time, Chrysler had spent hundreds of millions designing a more modern looking line of cars they would introduce in 1955. It was variously marketed as “The Forward Look” or “The 100-Million-Dollar Look.” (I have no idea why they added hyphens, but there they were. Perhaps they were also redesigning how words were to be separated in the new “100-Million-Dollar-English”!) Some articles about this transformation at Chrysler say they actually spent closer to $250 million on the redesign, but I suppose that number didn’t sound as crisp in advertising copy to the Madison Avenue crowd. 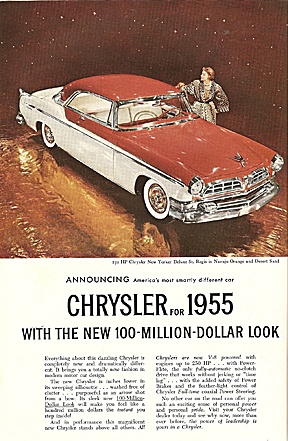 This new “look” extended to the whole Chrysler lineup, which included the Plymouth, Dodge, Desoto, and Imperial brands, so it was a huge retooling. And along with the new exteriors that appeared quite modern, almost revolutionary, to a seven-year-old, they also featured smoother transmissions, more powerful engines, silkier steering and braking, and plushier interiors. Our car, like many with The Forward Look, was two-toned. The roof, hood, and front bumpers were Royal Blue, divided from the light blue lower half by a prominent chrome slash that ran the lengt h of the car like a gleaming Mason-Dixon line. The tail lights were thin and tall, with lots of bulbs. The front grill was called an “egg-crate.” The tires had wide white walls, as did most of the fancy cars of that vintage. Inside, the bench seats were probably light blue (although I cannot be sure) and might actually have been leather. I do recall that parts of the dashboard and steering assembly were blue, and there was a stylish AM/FM radio with lots of push buttons and a round analog clock affixed up front. I think the gear lever of the new, effortless hydraulic transmission was mounted on the dash, which if I’m correct was a radical, even controversial concept. (Could a driver accidentally shift into reverse with a stray elbow while dousing his cigarette in the ashtray?) In any event, she was certainly a beauty! And as the ad promised, this car was sure to enhance my father’s sense of “personal power and personal pride!” The italics were Chrysler’s. When the day came to pick up the car, I remember it as a major family event. We went to the dealership, where my father strode around his new acquisition with the salesman as he pointed out various features and reinforced my dad’s conviction that he had bought a truly magnificent machine. His pride and power were growing before our very eyes. He signed the papers and then we took off. It was to be a very special day. We were going for a long 80 mile drive up to Hyde Park, just north of Poughkeepsie, to break in the new car and see the historic home of President Franklin D. Roosevelt, that was listed on the National Register. We would take the Bronx River Parkway, which was close to where we lived, up to the Taconic Parkway, itself largely championed by FDR. Fulfilling his vision for a scenic highway through the Hudson region, planning on the Taconic began in the 20’s; ground was broken in 1931. The construction lasted over four decades. The project was not completed until the 1960s, so I’m not certain how much of that drive in 1955 was actually on the Taconic of today — some of it may have been on country roads that followed the same route. Nevertheless, I loved being in the spacious, cushy back seat with my brother, smelling the leather, and gazing out at the magnificent scenery. We made it safely to our destination. I recall it being a bright, warm, and sunny day, most likely in spring or summer, and I suppose we strolled the grounds and walked through the homes, gazing over the red velvet ropes into the library where HE worked and the kitchen where THEY cooked. It must have been grand for a kid like me. But the most memorable thing of all happened in the parking lot as we prepared for the drive home. I remember this very clearly. You see, our brand new Chrysler New Yorker, with the two-tones and the hydrostatic wahtchamagig and The Forward Look would not start. For heaven’s sake, IT WOULD NOT START! My father must’ve turned the key a hundred times. Nothing. He lifted the hood as if he knew what was under it and could magically figure out what was wrong. I don’t recall him being angry. What I do remember is that he had lost much of his pride and power. Hood up, scratching his head, and no doubt wondering how we would ever get home, he sat on a stone wall beside the car, forlorn and deflated. Then a sort of miracle occurred. A man wandered over who, my father would later tell me, was a Chrysler mechanic who was actually trained in these new car engines. Apparently, this wizard was able to get the car started, and he told my father to get it to the dealer and have it fixed right away. It was something he had seen before. And so, we got home. From that day on, the car was nothing but trouble. Something was always making a bad sound — failing, dying, gasping, clanking, clicking, groaning, squeaking, or breaking. Fumes rose, smoke drifted, liquid leaked. The pride and power were gone, replaced with a feeling of what the heck did I buy? After a few years, my father sold the Chrysler and bought a used Ford sedan. That one I remember was black, but had large chrome skirts over the rear wheel openings. My father had decided to trade in his P and P for flashy and youthful. My failure to receive any mechanical training at home extended to my schooling. In middle school, which was called Junior High School in NYC back then, I was put into a printing class where I learned to set type and carve linoleum tiles into patterns that could be inked and printed onto paper by our own manual printing press, donated to the school I imagine by Guttenberg himself. While other, more “mechanically inclined” or “industrially tracked” students learned valuable skills like woodworking, carpentry, or even car repair, I diligently acquired printing expertise from the 19th century that was totally obsolete in the 1960s. I can say with absolute certainty that those skills have never proved useful to me at any time since that class ended (except perhaps that I understood what “font size” meant on the computer, marginally before my peers). Later, when I attended the Bronx High School of Science (about which I can only say wonderful things), no mechanical training was offered. My electives were Microbiology (where I learned to infect a Petri dish with bacteria, and then stain it) and Blood and Urine Analysis (a perennial favorite involving our favorite bodily fluids). There, by the way, the toughest guy at Bronx Science, Mike Segal, who could barely pass his classes but was a huge brute and the star athlete on our football “club,” was my lab partner. To everyone’s surprise, on day one, he passed out cold and hit the ground hard the very first time I lanced his finger to draw a drop of blood. Oh, how the mighty will fall! For the rest of the semester, we used only my blood. Fortunately, he could pee. High school was probably my last chance to obtain any formal mechanical education. None of my friends had private homes, garages, or cars. We all lived in apartments and took buses and subways to get around the city. My technical ignorance was sealed, and it led to a lifelong lack of confidence when it came to sticking my hands into something mechanical or electrical. The funny thing is that when I have assembled things, or made minor repairs, I’m not all that bad at it. I can read and follow instructions (something, however, I am told “real” men don’t have to do), and I usually get the job done. I will admit that occasionally I have to take the thing apart and reassemble it because I did something out of order, or misunderstood some step or connection. Sometimes I end up with extra screws or nuts. It takes me longer than I think it should. But eventually I get the thing done. I believe I could’ve been a decent mechanic if only given the chance. So now, in my 60s, I find myself at the track surrounded by men (and women) who have grown up with garages and cars and fathers who thought them how to dive in and fearlessly take things apart and put them back together. They’re not afraid of breaking something, or blowing something up. They’re confident that whatever obstacles come along, they will persevere, figure it out, overcome the problem, fix the thing, or replace the part. I watch with interest as they remove tires, swap out rims, slide under the chassis to tighten, loosen, adjust, or replace various parts, push this and pull that. They know just which tool to use, how much to tighten a screw or a bolt, how many turns to calibrate an assembly, how hard to strain before giving up and trying another approach. They talk about the job they’re doing and give each other encouragement. They share tools and tips. It’s all wonderful, and I’m just not a part of it. I am very envious. But slowly, with the help of a few friends in the club, I am learning how to care for my 2005 Porsche Boxster and do some minor things to it. I know where all the hidden places are, where to put oil, water, brake and windshield washer fluid. I understand what all those numbers mean on my tires. I even know how to attach my trickle charger. It’s a start. But heaven help me if the IMS bearing goes. All I can say is, if you’re ever lost in the Bronx and feel alone and in danger, call me. You see, I know everything about how to get you out of there. And because I’m a city boy, they don’t frighten me a whit. I’ve easily navigated the tubes in London and Tokyo, found my way about Marrakesh and Vienna, felt at home in Shanghai and Hong Kong. Every upbringing leaves its own footprint and skill set. It turns out that I did learn some things back there in the Bronx that come in handy. Just not under the hood.